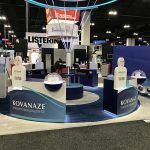 The new 20’x30’ island booth for St. Renatus was the debut of Kovanaze Nasal Spray – a new product that delivers needle-free anesthesia. It is the first ever nasal spray that provides regional, pulpal anesthesia in teeth no’s 5 – 12. The main goal was to provide information and to create a buzz, so the audience learned that an exciting new product launch is happening. The idea was to create an environment that would capture everyone’s attention. They wanted the experience to be hands on and informative, while at the same time making doctors feel comfortable and relaxed. The key solution to attract people to the booth was to incorporate a spray-like movement, using LED lighting. 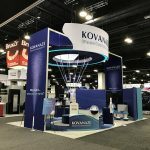 The structure’s focal point is a circular fabric branded sign with chasing LED lighting moving up and out from a large mock-up of the spray applicator, symbolizing the spray technique. The color palette was made up of cool soothing blues. The shapes were curved and rounded. At the heart of the booth was a circular station with four iPads to provide more detailed information about the science behind the product. An open theatre attracted 10 to 15 doctors at a time to listen to a presentation given by an expert dentist. Many people were enthralled with the presentation and picked up their stools to move closer to the presenter. The booth had four rep stations utilizing head-like silhouettes with openings at the nasal cavity, so that the doctors could practice spraying a placebo mist into the silhouette nostrils. There was also a clear dome-covered display on the station tops with product and packaging inside, allowing the doctors to see what the product would look like when it arrived at their practice. The traffic was amazing and the buzz was huge. The exhibit was a big hit with attendees and the client. The media was very intrigued and many doctors immediately placed orders. All participants enjoyed the experience while learning about all the applications and benefits of Kovanaze Nasal Spray.